Asteroid belt Asteroids are rocky and metallic objects too small to be considered planets. 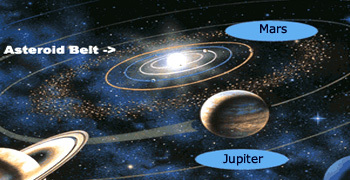 Most asteroids orbit the sun in a tightly packed belt located between Mars and Jupiter. Asteroids in Latin means&apos;"Star like" but asteroids are not like stars at all and they may be more accurately called planetoids. These are rocky metallic bodies found usually in the main belt (Gaspra and Ida) between Mars and Jupiter, revolving around the Sun. Jupiter is the largest planet in our solar system, and its gravity is very strong. Asteroids, which are much smaller than planets, are sometimes pulled out of the asteroid belt by the force of Jupiter’s gravity. Many of these asteroids then travel toward the inner solar system – where they can collide with Earth. Asteroids provide sustainable resource Researchers want to find out whether asteroids contain minerals and other resources that can be mined and used on Earth or for space-based industries. Why do we need to study Asteroids? The study of asteroids becomes important as they cause extreme damage when they strike the earth even though it happens rarely. 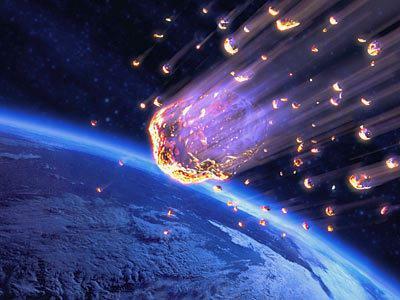 Smaller asteroids are believed to strike the earth every 1000 to 10,000 years. Modern scientists estimate that if an asteroid is found to collide the earth with in 30 to 40 years, there could be possibilities that include to explode the object before reaching the surface or to divert it using technology. Estimating the collision course of the asteroid and finding a proper measure to explode it is the major aspect while studying the asteroids. On February 12, 2001, a spacecraft landed on the surface of an asteroid for the first time in history. After a year spent orbiting the asteroid 433 Eros, the Near Earth Asteroid Rendezvous (NEAR) spacecraft made a controlled descent to the surface. How come Asteroids are dangerous? Steven Ostro of Jet propulsion laboratory said that there could be 100 million asteroids larger than ten meters moving around in the sky in different courses and at different speeds. It is possible that around two thousand asteroids big enough to effect the life on earth are crossing the earth’s orbit regularly. Asteroid named as 1991BA was spotted in 1991 passing by at a distance of 106 thousand miles which in cosmic terms is like a bullet passing through one’s sleeve without touching the shoulder. The closest pass recorded is about 90,000 miles from Earth. According to Timothy Ferris, such passes are likely to happen about two or three times a week. Since it formed over 4.5 billion years ago, Earth has been hit many times by asteroids and comets whose orbits bring them into the inner solar system. Collision of asteroids can cause massive damage on local to global scales. The K-Pg event It is a global extinction event responsible for eliminating approximately 80 percent of all species of animals at or very close to the boundary between the Cretaceous and Paleogene periods, about 66 million years ago. The Manson impact crater, near the site of Manson, Iowa where an asteroid /comet struck the Earth during the Cretaceous Period, 74 million years ago is one of the largest known impact events to have happened in North America. The site at the time was the shore of a shallow inland sea hit by a meteorite about 2 km in diameter. 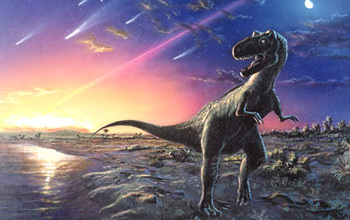 The Cretaceous–Paleogene (K–Pg) extinction event, formerly known as the Cretaceous–Tertiary (K–T) extinction, was a mass extinction of some three-quarters of plant and animal species on Earth — including all non-avian dinosaurs — that occurred about 66 million years ago. It marked the end of the Cretaceous period and with it, the entire Mesozoic Era, opening the Cenozoic Era which continues today. In the geologic record, the K-Pg event is marked by a thin layer of sediment called the K–Pg boundary, which can be found throughout the world in marine and terrestrial rocks. The boundary clay shows high levels of the metal iridium, which is rare in the Earth's crust but abundant in asteroids. It is generally believed that the K-Pg extinction was triggered by a massive asteroid impact and its catastrophic effects on the global environment, including a lingering impact winter that made it impossible for plants and plankton to carry out photosynthesis. K–Pg extinction The extinction was characterized by the elimination of many lines of animals, including nearly all of the dinosaurs and many marine invertebrates. The impact hypothesis was bolstered by the discovery of the 180-kilometer-wide Chicxulub crater in the Gulf of Mexico in the late 1970s which provided conclusive evidence that the K–Pg boundary clay represented debris from an asteroid impact. 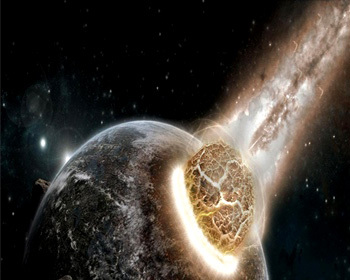 The fact that the extinctions occurred at the same time as the impact provides strong evidence that the K–Pg extinction was caused by the asteroid. However, some scientists maintain the extinction was caused or exacerbated by other factors, such as volcanic eruptions, climate change, and/or sea level change. A wide range of species perished in the K–Pg extinction including the non-avian dinosaurs, mammals, pterosaurs, birds, lizards, insects, and plants. The K–Pg extinction devastated the giant marine, plesiosaurs, fish,sharks, mollusks and many species of plankton in the oceans. It is estimated that 75% or more of all species on Earth vanished. The devastation caused by the extinction however provided evolutionary opportunities as many groups underwent remarkable adaptive radiations — a sudden and prolific divergence into new forms and species within the disrupted and emptied ecological niches resulting from the event. Mammals in particular diversified in the Paleogene, producing new forms such as horses, whales, bats, and primates. 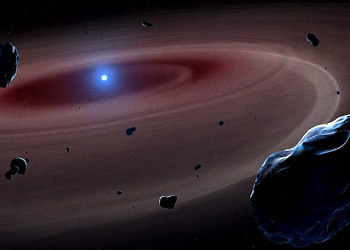 Scientists thought that the asteroids were the remains of an exploded planet by observing that the smaller asteroids are more in number than the larger ones. Later they discovered that all the fragments of asteroids when combined will not even make half the Earth's moon and hence concluded that Asteroids are not from an exploded planet. Scientists believe that the Asteroids are the remains of the fully formed solar system, with the irregular objects that didn't merge to form a planet. Carbonaceous asteroids are stony and darker than coal, silicaceous asteroids are bright, stony bodies that have metal, while metallic asteroids are exposed metallic cores from larger bodies. What are the types of Asteroids? Asteroids are classified in to three basic types based on their orbits and the composition. C–type:Carbonaceous type of asteroids have clay and stony silicate rocks. These are most common type of rocks with greyish in color. Almost 75% of asteroids come under C–type. S–type:Silicaceous type of asteroids have silicate minerals along with nickel and iron. These appear in greenish to reddish colors. Almost 18% of the asteroids come under this S-type. Most of them are present in the inner region of the main asteroid belt. M–type:Metallic type of asteroids have nickel and iron as the major components. These appear in reddish color. The rest 6 to 7% of the asteroids come under this classification. Most of these are present in the middle region of the main asteroid belt. 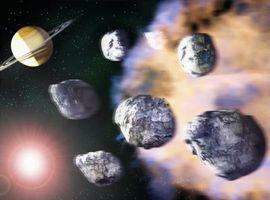 Asteroids come in many shapes and sizes A few of the largest asteroids are nearly spherical, like the Earth. Ceres is a good example. 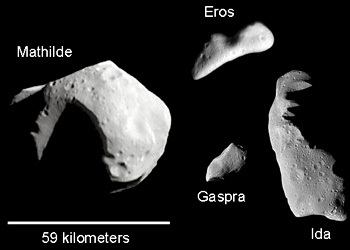 Most asteroids, however, are very irregular, like Eros (which was visited by the NEAR spacecraft in 2000). Asteroids are small, rocky bodies that orbit the sun in between the orbits of Mars and Jupiter, which is anywhere from 2.1 AU to 3.2 AU from the Sun. They are smaller than planets but larger than meteoroids, meaning that an asteroid can range from a few meters wide to hundreds of km wide. Ceres is the largest with a radius of 284 miles.These Asteroids consists of mostly rock and ice, with certain metals like iron and gold present in large percentages. There would be no air present inside the asteroids. These asteroids (formed during the formation of solar system) are nothing but the left over parts that were to form planets. Every asteroid rotating in the main asteroid belt has a different temperature. Temperatures in the asteroid belt range from 200 K (–163°F) at 2.2 astronomical units (AU) from the Sun to 165 K (–226°F) at 3.2 AU from the Sun. The average temperature of the asteroid could be around –1000°F (–730°C). The scientists estimate that more than 75,000 asteroids are present in the main belt. Most of the asteroids present in the main belt have elliptical shapes and revolve in the same direction as the Earth. More than 200 asteroids which are 100 kilometers in diameter, are present in the main belt. There are other small asteroids like 1991 BA which was found in the year 1991, with a diameter of 20 feet. There are more than 20,000 known asteroids. 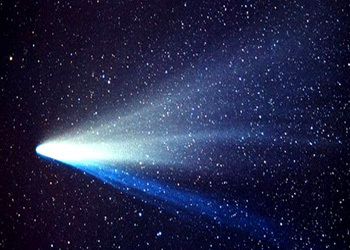 Comet A comet is a relatively small solar system body that orbits the Sun. When close enough to the Sun they display a visible coma (a fuzzy outline or atmosphere due to solar radiation) and sometimes a tail. The main difference is where they are when they are being observed. Comet: A relatively small body compared to the objects of solar system, which orbits the Sun. It displays a coma (a fuzzy outline due to solar radiation) and a tail as it gets closer to the Sun. Asteroid: Asteroids are small solar system bodies, made of rock and metal that orbit the Sun, similar to comets but do not have a visible coma (fuzzy outline and tail) like comets do. Meteoroid: A meteoroid is a small rock or particle of debris in our solar system, smaller in size compared to Asteroids. They range in size from dust to around 10 meters in diameter. They're kind of like smaller asteroids. Meteor:A meteoroid or an asteroid that burns up as it passes through the Earth’s atmosphere is known as a meteor. Meteor is the streak of light or ‘shooting star’ we observe occasionally in the sky at night. The Leonid and Perseid Meteor showers occur when the Earth passes through a comet's trail. The Leonid shower is due to the Temple-Tuttle comet, which passes near Earth's orbit every 33 years. The Perseid shower is caused by the comet Swift-Tuttle, which speeds through roughly every 130 years. Meteorite: A meteoroid that survives falling through the Earth’s atmosphere and colliding with the Earth’s surface is known as a meteorite. A meteorite is a meteor that actually lands on the surface of Earth. If an object large enough to be considered an asteroid enters the atmosphere, its remnants are also called meteorites if they impact the surface. An asteroid is always going to be in space and when it enters an atmosphere it becomes a meteor, then a meteorite if it hits the ground. 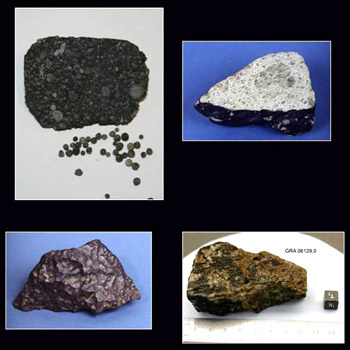 Types of Meteorites Although there are a large number of sub classes, meteorites are divided into three main groups: irons, stones and stony–irons. The number of meteors weighing 3.5-ounces and entering the atmosphere every day would be about 20,000 and if we consider smaller ones the number would be in billions. Meteorites the size of dust particles enter the atmosphere each day by the billions. The Nakhla meteorite reportedly killed a dog when it touched down on June 28, 1911, in Egypt. Chicxulub decimated most of the life on Earth 65 million years ago. The 4.5-billion-year-old Cape York Meteorite, discovered in 1894 in Greenland is nearly as old as the Sun and slammed into Earth some 10,000 years ago. A 160-foot meteorite landed in Arizona about 50,000 years ago, leaving behind a mile-wide and 50-foot deep gash in the ground, which is now called as the Barringer Crater, or Meteor Crater. The six mile wide Vredefort Meteorite caused in South Africa, a crater which is 186 miles in diameter. The two billion-year-old Vredefort Dome in South Africa is the site of the biggest impact crater on Earth. The recent ones include a meteor strike in Peekskill, NY, thumping a 1980 Chevy Malibu in the trunk. The age of Meteorites can be estimated using latest dating methods called isochron method by measuring the decay products of the radio active isotopes. Meteorites are the oldest objects that can be used by the dating methods to know the age of the Solar system which is estimated to be 4.5 billion years. 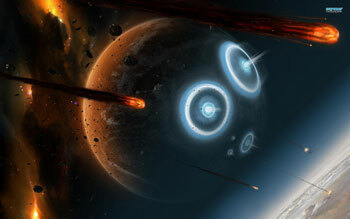 The study of the meteorite becomes important in knowing the secrets of cosmos regarding the birth of the solar system, conditions involved during the formation of solar system, components that are present in it, age of the meteor and also to study the conditions that led to the formation of a meteor.